Climate change threatens to reverse decades of development gains in poor countries, and its impacts are likely to be felt first and worst in poor countries and communities. Avoiding irreversible catastrophic events is not possible without reducing emissions from forest loss. This CGD initiative is investigating performance-based financing mechanisms to help safeguard forests and the benefits they provide to the global climate and more directly to the people who live nearby. Climate change threatens to reverse decades of development gains in poor countries. It is especially pernicious because its impacts are likely to be felt first and worst in poor countries and communities. Despite the urgency of the problem, progress in UN negotiations proceeds at a snail’s pace. Reducing carbon emissions from deforestation and forest degradation has become an important part of the international climate agenda. The 2006 Stern Review identified reducing emissions from deforestation as one of four pillars of any climate mitigation strategy. UNEP’s 2011 Bridging the Gap report shows that better forest conservation could provide up to 18 percent of emissions reduction before 2020. The world can’t hold global warming below 2 degrees Celsius—above which climate impacts on food production, water supply and ecosystems are projected to increase significantly and irreversible catastrophic events may occur—without reducing emissions from forest loss. Forests are also crucial to economic output, livelihoods, and ecosystem health on which many people in developing countries depend. A proposed payment mechanism called REDD+ would transfer funding from industrialized countries to developing countries with tropical forests to “Reduce Emissions from Deforestation and forest Degradation” (REDD) and to sustainably manage forests and conserve and enhance forest carbon stocks (the “+” part). Under REDD+, finance from industrialized countries would be contingent upon recipients achieving verified results and compliance with social and environmental safeguards. Current work on the REDD+ mechanism is seen as a bridge to a future in which industrial countries make ambitious commitments to reduce their own emissions. Some portion of these commitments can be met by paying for reductions in forest countries. While there is international consensus on the need to conserve forests, progress on establishing a global REDD+ mechanism has been slower than many had hoped. A host of important initiatives have made progress in understanding and testing the component parts of REDD+. But large-scale pay-for-performance international finance directed to the national level is only in the early stages of piloting through a few bilateral agreements. The development of the REDD+ mechanism has been hampered primarily by lack of ambitious climate commitments by industrial countries. In addition, there are problems regarding the adequacy of available data and methods to establish baselines and measure change; the weak institutional capacity and policy standards in recipient countries; the lack of consensus on the appropriateness of a market-based financing mechanism for forests; and the complexities introduced by the use of Official Development Assistance (ODA) funds to finance REDD+ programs. CGD’s prior work on COD Aid and other performance-based funding models, and the rapid progress in high-frequency remote sensing techniques to monitor forest status, including FORMA, provide an opening to help address these problems. In the face of these challenges and in view of the critical importance of conserving forests, CGD will conduct research, communications, and policy outreach activities to increase understanding of the central role of forests in meeting climate and development objectives, and to increase the availability of performance-based finance for forest conservation. In particular, CGD will explore the potential to apply the principles and ongoing experiences with COD Aid to forest conservation. 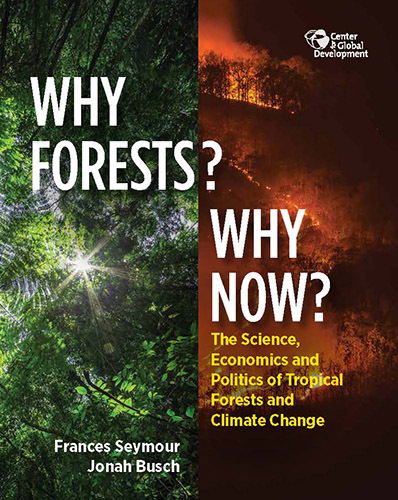 To this end, CGD senior fellow Frances Seymour and research fellow Jonah Busch are leading the preparation of a book titled “Why Forests? Why Now?” that will bring together the most up-to-date science, economics, and politics surrounding forests, climate, and development to make the case that forests conservation is more urgent — and more achievable — than ever. On the basis of the evidence from the report, CGD senior associate Michele de Nevers is organizing an expert Working Group that brings together high-level development, aid, finance, and climate experts and decision-makers to identify options to reinvigorate, scale up, and finance performance-based solutions to meet the objectives of REDD+.